Most of the collection is 1:43 scale and mostly Formula One and V8 Supercars. I’ve also got (but not necessarily on display) Indycar, NASCAR, LeMans-prototypes and Aussie road car models, plus other odds and ends like presentation & test cars, some rally cars etc. Most are ready-built diecast or resin models, but there’s also a number of kits. The collection is largely in mint condition, however it does feature a number of code-3 and ‘enhanced’ items because, unlike today, some of the earlier models didn’t have particularly good detail or finish. 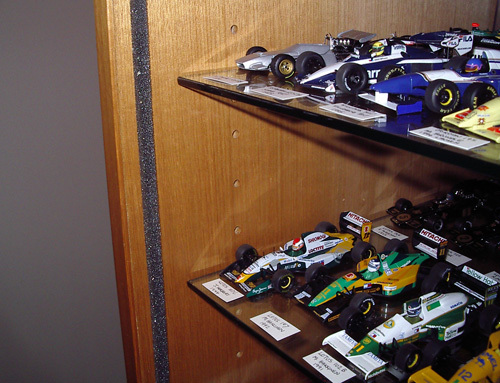 1/43 and 1/20 scale Formula 1 kits. I’m interested in both white metal and resin kits, built or unbuilt, particularly of the lesser known private and backmarker teams and drivers. Would also consider Indycar and NASCAR models, kits or builts, in 1/43. Australian Road Cars – Australian road cars: utes, sedans, vans and wagons, Holdens, Fords, Chryslers – even the Leyland P76! Rally Cars – Not of major interest to me, but I have the full DeAgostini mail order rally car collection (which I’m prepared to sell – see For Sale page). 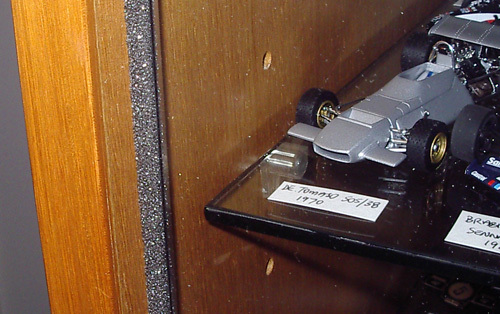 Everything Else – Models that don’t fit the above themes, such as Formula 2, Formula 3, various test and launch cars, promotional models, GP Bikes etc. I’ve built quite a number of the Tamiya 1:20 Grand Prix range of kits – see some of their Build Diaries. 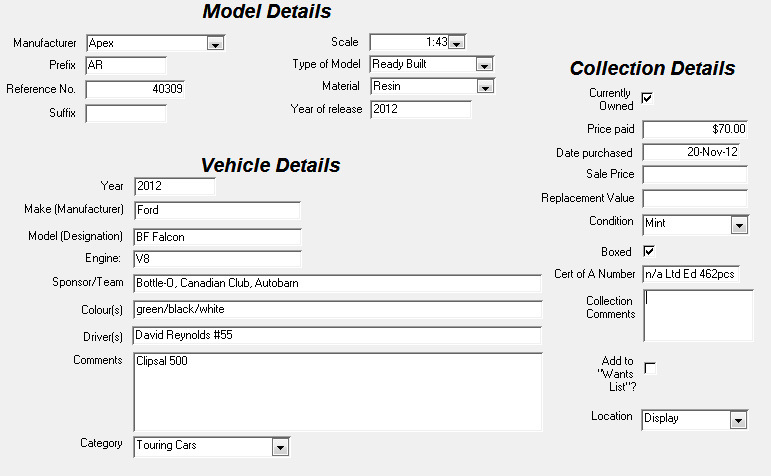 See completed Code 3 builds HERE and Enhancement/Fixes/Tobacco Conversions HERE. I maintain a record of the entire collection in an Access database I created. It records details of the model (Manufacturer, Ref No, Material, Year of Release etc), the car (Year, Make, Model, Engine, Driver etc) and my particular item (Cost, Date of Purchase, Cert # etc). I also have a “Wants List” document of models I’ve missed or items I need to source for Code3 projects. The two cabinets I have are deep enough to have 3 rows of 1:43 scale models per shelf, so it’s rather hard to see detail on the cars up the back. Each cabinet (2nd hand ex-shop display) is roughly 1650mm high, 700mm wide and 400mm deep. Above & below: Detail of the foam strip I use to prevent dust from entering the cabinet where the sliding glass doors interface with the cabinet wall. The white cards identify each model with car make, model, year and driver. More photos to follow… some day.